I don't know if anyone has ever successfully found a job lead through a blog, but it's worth a try. I am looking for a job, and I would be thrilled to hear about any possibilities my brilliant readers might know of. A little background: I am a graduate of Wesleyan University ( English) and the Culinary Institute of America (Baking and Pastry Arts). I spent some time working in kitchens, but have spent the last six years at Harvard as something of a factotum for a research group. My official title is "data coordinator," but that involves some research, some writing, some database development, some website management, some project management. I would like to find a job that would allow me to pursue my passion: the promotion of sustainable agriculuture, the development of relationships between farmers and consumers, the building of strong and healthy communities through the remarkable medium of our meals. I am ready to leave the city and would ideally be interested in a job somewhere in Vermont, NH, Western Massachusetts or southern Maine. If you think you know of a job to which I might be suited, please email me at kjweldonatyahoodotcom. Thanks. That was just what came home with J. and myself (minus a bottle that's already been given to a friend). Another in the party bought a case on her own. I think some of the others thought we had gone a little crazy. 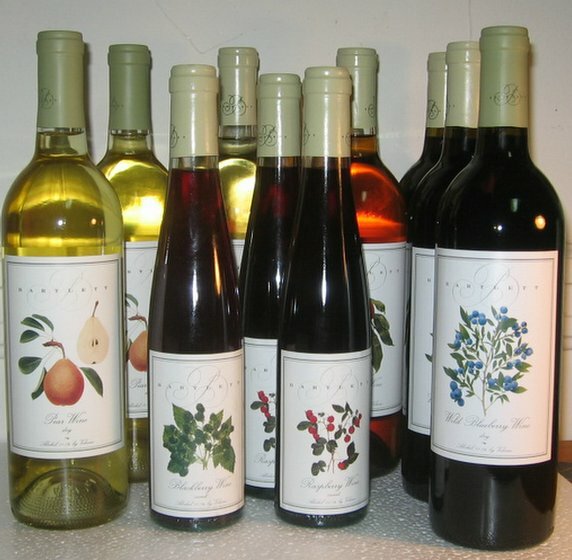 The Bartlett winery is a fruit winery, you see, and the wines we bought were made from blueberries, pears, raspberries, blackberries, apples and peaches. The reputation of fruit wines is humble to say the least. At best someone might have a fond recollection of a grandparent's elderberry or dandelion wine. At worst, people think of Boone's. Bartlett's wines are real wine. 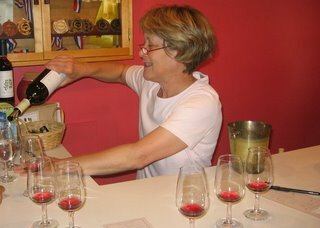 The dessert wines are sweet, but not syrupy, with bold clear fruit flavors. The dry wines are genuinely dry and crisp, with varying degree of fruit. In some of the whites, the pears or apples could pass for grapes; in the blueberry wines, the blueberry flavor comes through, but with the complexity of a grape wine. These are not souveniers for tourists; these are serious wines, and I was thrilled to try them. To me, this represents the best of the locavore impulse: the creative, intelligent use of locally-grown materials to create a fine product that tastes of the place of its origin. Also, the woman who was pouring was very nice, and the winery itself is lovely. If you're ever up in that area, do try to visit. The place we rented was a cottage owned by, and located on, Painted Pepper Farm, a maple syrup and goat farm in Steuben, Maine. The farm is owned by a lovely couple who raise chickens and goats (and daughters), as well as tapping maple syrup, growing some vegetables, making maple-syrup nuts and granola, and picking berries. They sell their products on the honor system from a farm stand attached to their house. The maple syrup items are inside, and outdoors there's a refrigerated case for the eggs, goat's milk yogurt and an odd watermelon or pint of blackberries. We were surprised to learn that they do not make goat cheese. All their milk is used either fresh or in yogurt - amazing, rich, sweet yogurt. 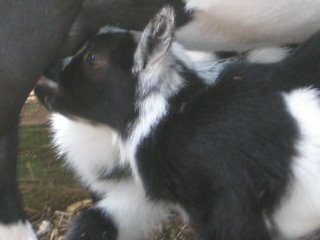 Their herd is made up exclusively of Nigerian dwarf goats, which produce a lovely milk, but not much of it. The milk makes great, but prohibitively expensive, goat cheese, so they focus on the yogurt. Actually, the yogurt was pretty pricey, too - I don't know if that was entirely due to the price of the milk, or if the elegant glass containers pushed the price up significantly. In any case, the quality of the yogurt justifies the price, and apparently their herd has quite a following. People drive several hours up the coast to stock up. The goats were charming animals, very interested in our comings and goings. They loved to have their heads scratched, and one would respond to attentions by making a noise deep in his throat very much like a purr. There were one-week-old babies that left us weak-kneed. (Okay, they left ME weak-kneed). 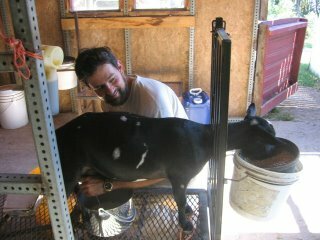 We city-slickers also learned a few things about goat-raising. First important lesson: the billy goats will start to smell - the stinkiest goat-cheese smell - just before breeding time, and if you pet them at that point, your hands will smell for days. We avoided the petting, but we can verify the stink. Also, the vigorous headbutting that was going on in the new mothers' pen occurs every time a new goat is added to the group. The structure of dominance needs to be determined. 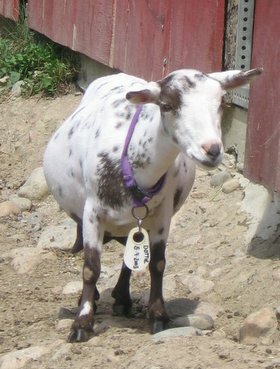 Sadly, Peppermint Patty, the new goat to the group the first night of our vacation, ended up clearly at the bottom of the herd. She failed to headbutt with proper vehemence. So far, none of these goats have ended up in goat stew. The farm is expanding its herd, so females kids are welcome to stay. The boys are sold as pets - apparently, their size make them popular for 4H club members, and some people like to keep them as company for horses. Learn something new every day. An extra can of soda a day can pile on 15 pounds in a single year. I love that "extra." Don't worry, it's not your normal allotment of soda that's the problem, it's extra soda. Somebody should have spent a little more time working up the press release. I lost my copy of the Jane and Michael Stern's Roadfood in my divorce, and it still makes me bitter. I have the new version, but I was attached to that copy that had travelled with me to so many drive-ins and clam shacks, diners and hot dog stands. 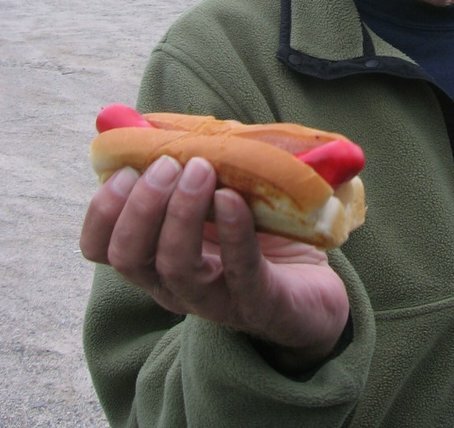 I love road food, love the simple, strong flavors, the sense of joy and freedom of eating with your hands at a picnic table next to your car. Lobster fettucine has its place, but so do clam rolls. Particularly clam rolls made with fresh, big-belly clams. 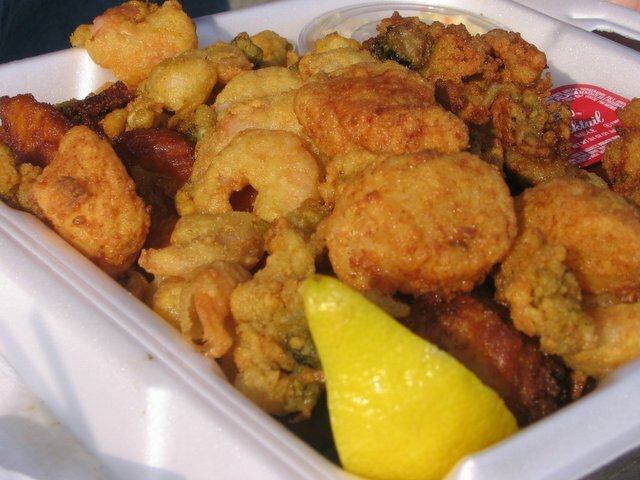 Here's a plate of fried seafood to make you weep. Scallops, clams, shrimp, and under all that, a big slab of haddock. All fresh and local. All amazing. 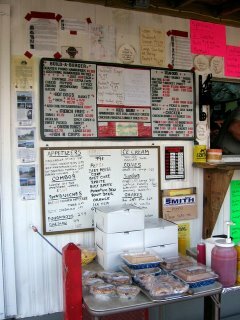 Notice the locally-made blueberry pies and cakes on the table in front of the menu. 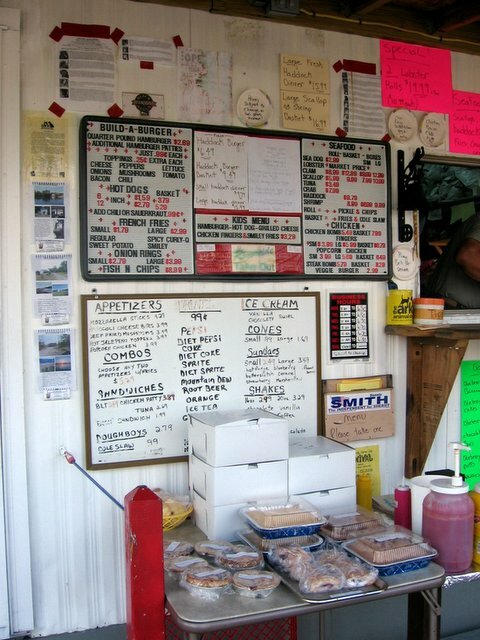 I dare any foodnik to drive by without stopping. "That don't have this in Austin." That was the review of a Texan in our vacationing group. The blueberry may mean Maine to Mainers, but to out-of-states, lobster means Maine and Maine means lobster. 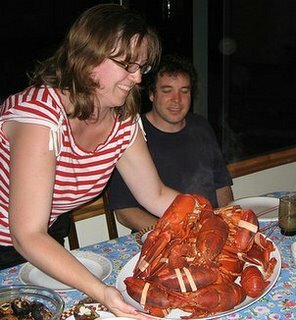 And it's true that if you've only eaten frozen or pre-cooked lobster, or even lobster from a tank at a supermarket, the lively, just-out-of-the-ocean seabugs you can get in Maine are a revelation. We took a lobster-fetching trip to Jonesport, about a half-hour ride up Route 1 from where we were staying in Steuben. Jonesport is a working fishing town, small and picturesque. To buy lobsters, you go down to the fisherman's co-op dock at about 5 at night when the boat comes in. 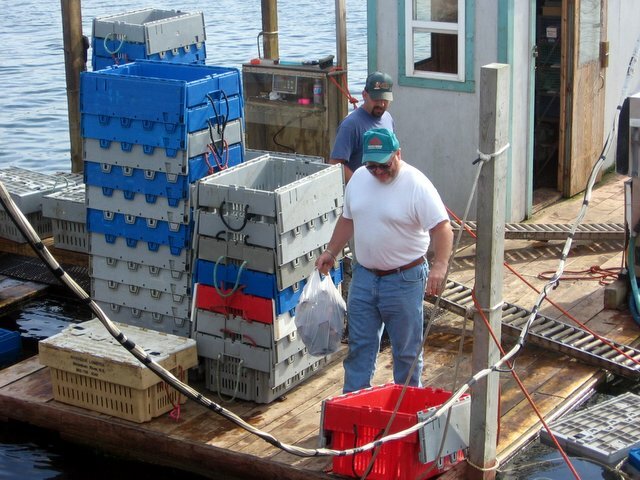 You call down your request to the lobsterman, soft or hard shell and the number of pounds or number of lobsters. Then he takes the lobsters out of the underwater holding crates, weighs them up, puts them in a bag, and drags himself with his delicious bundle across to the stairs on a float. We paid $7/pound for hard-shell. Once home, the water should be put on the moment you walk in the door. Once you have a full boil, you're just six minutes away from seafood perfection. We bought more lobsters than necessary for that first dinner, because nothing feels better than knowing you have leftover lobster in the fridge. All the carcasses, minus the liver, were put back in the pot to make stock. I simmered the shells for over an hour, then put the stock in the fridge and went to bed. The next day I removed the shells and simmered the stock down a bit more, until it was rich and condensed. We had enough shells to get two quarts of very flavorful stock. Crumble the sausage and brown in a little oil (or do as I did and use the butter in which the lobster had been dipped). Remove and drain. Pour off fat. Melt butter, add thyme, (add minced shallot briefly if using), then add the flour and cook roux to remove raw flavor of flour, about 30 seconds. Whisk in stock and cook until slightly thickened. Add cream and cook a few minutes more. Add lobster and sausage and heat until warmed through. Add wine, salt and pepper to taste, and paprika if the color needs improvement. Taste, make adjustments, pour over fettucine and serve. Lobster is of course not the only seafood available in Maine. 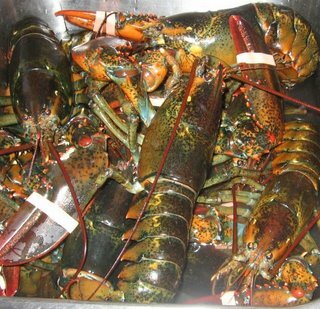 The last night of vacation, I used the last of the lobster stock in a chowder - J. 's favorite chowder, in fact, beating out clam. Remove the kernels from the ears of corn. Put the cobs into a pot with the lobster stock and simmer at least 1/2 hour. Brown the bacon, remove. Use the fat from the bacon to cook the onions. Add the potatoes and give them a few turns in the fat as well, maybe two minutes. Add the celery seed and smoked paprika and cook about thirty seconds more. Then add the stock and bay leaves and simmer on low until the potatoes are cooked. Add the crabmeat and corn kernels, plus the cream and allow to heat through. Taste and season with salt, pepper. Both recipes serve about eight normal people, or six who have spent all day hiking up a mountain. 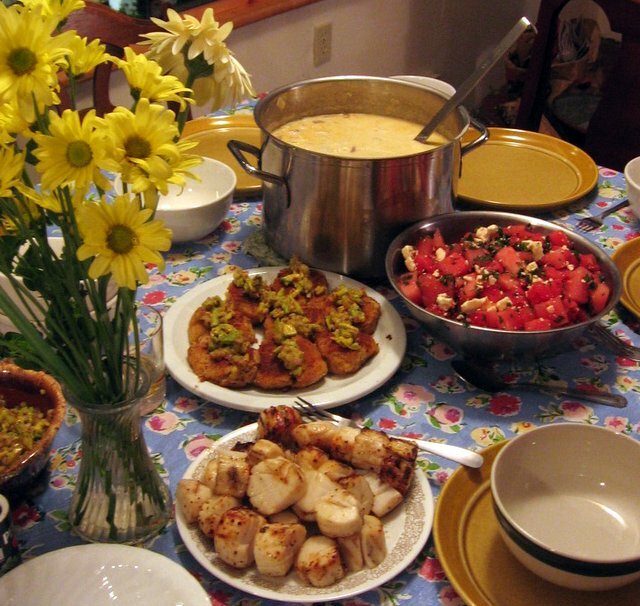 I served the chowder with Nigella Lawson's watermelon-feat-mint salad, some grilled vegetables, grilled scallops simply prepared with olive oil and pepper, and crabcakes. The crabcakes were pretty straightforward, just leg and claw meat bound together with a little egg and bread crumbs, spiced with Penzey's Northwoods seasoning, browned in butter, then topped with avocado, lime and red onion. The scallops were from Nova Scotia, not far away in those parts and the best source of scallops in the world. They were marvelously sweet. One member of the group had a piece of swordfish, but it's worth noting that in Maine, seafood mostly means shellfish and haddock. Other fish are caught in the local waters, including salmon, but scallops, lobster, shrimp, crab and even mussels, quahogs, and winkles seem to dominate over finfish, except for the ubiquitous haddock and the occasional cod. That's fine by me. Despite the efforts of Beyond Salmon, I'm still a shellfish girl at heart. Washington County, Maine produces something like 90% of the world's wild blueberries. If you hit the season just right (we were off by a few days this year), the fields along the road shimmer blue. In the fall, the berry bushes turn vibrant red. It's a lovely place. Wild blueberries, in case you're unlucky enough only to have had the big, cultivated type, are tiny, a pain to pick (though they can be raked with a special device that catches the berries in a pan) and incredibly flavorful. They are also really good for you. They're high in antioxidants, I assume in part because they have such a high skin-to-flesh ratio. The good people at Wyman's, the major player in wild blueberries and a big employer in Washington County, have realized health benefits make for a good marketing opportunity. In recent years their wild blueberries have been made available frozen in the supermarket year-round, as well as in the form of juice, and of course the canned pie filling they have always sold retail. This is altogether a good thing, but, given the ease of acquiring wild blueberries in the last few years, I thought I would be less excited than I used to be about being in the wild blueberry capital during the peak season. The people of Washington County have embraced the blueberry. The blueberry represents Maine as much as the moose or the lobster - maybe not to people "from away", but within Maine, there is no question. Blueberry pancake breakfasts are offered at every church and lodge. 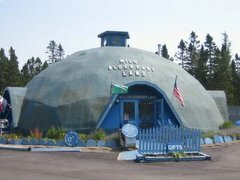 There's the big wild blueberry festival in Machias, with pie-eating contests, the blueberry musical, a blueberry run, and the annual raffle of a blueberry-themed quilt made by the women of the town. And then there's Wild Blueberry Land, a fantastic piece of roadside kitsch selling all things blueberry. What I found particularly charming about Wild Blueberry Land (besides the building itself, of course) was that the blueberry items were all pretty good. Sure, there were some nationally sold brands that just happened to have offerings in blueberry flavors, like a blueberry iced tea. But there were locally-made blueberry pies (excellent), scones (also very good), muffins (average), truffles (the chocolate was high-quality and the blueberry fondant filling was bright and fresh in flavor), as well as very good blueberry ice cream from Giffords, a Maine brand. In case you think that's all the blueberry products anyone should expect to find in Washington county - well, think again. Our group of vacationers decided to have a contest the last night to determine who had consumed the most blueberry items. I blush to declare myself the winner, the blueberry queen, as it were. In order to achieve such heights, I had to consume (or at least taste) raw blueberries, a blueberry scone, a blueberry muffin, French toast with blueberry compote, blueberry wine, blueberry ale, blueberry milkshake, a blueberry truffle, blueberry jam, blueberry soda, blueberry ice cream, blueberry banana bread, and blueberry coffee cake. But I did not even get a chance to try chocolate-covered dried blueberries, blueberry pancakes, blueberry tea, blueberry liqueur, blueberry sorbet, blueberry whoopie pies (! ), blueberry mimosas and blueberry cheesecake. Clearly, I have goals to reach in my next visit. This weekend my siblings and I hosted a 45th wedding anniversary/70th birthdays party for my parents. I catered, so that meant all the cooking I’ve done since the end of the Eat Local challenge has been party-related. I’ll give ya’ll the menu, because it was actually one of my best-planned parties. I fed about 45 people at a reasonable price; everyone ate a lot and seemed to really enjoy the food; the food wasn’t too scary for a conservative crowd, but was not so cliché-ridden as to bore me; and everything was done and in place when the first guest arrived without any last-minute craziness. I think the mix of purchased and homemade items was just about right - enough homemade to give flair and warmth, enough purchased to make things easy. Cheese plate: Generously provided as far, far below wholesale price by my friend A., the cheese salesman. There were about a dozen lovely cheeses. A basket of breads, including a large whole wheat Tuscan loaf, a long crusty white, some soft rolls, a ring loaf, and a multigrain. A tray of cold, sliced roasted meats: a boneless pork rib roast, a pair of beef eye or round, and a half-turkey. I rubbed the pork simply with black pepper and salt, the beef with black pepper, salt, and celery seed, and the turkey with Penzey’s fabulous Northwoods Fire Seasoning. An assortment of condiments, including (semi) homemade artichoke/caper spread, fig/caramelized onion spread, and horseradish spread, plus purchased tapenade, mustards, and mayo. A vegetable platter made up of steamed green beans in basil oil, steamed asparagus, roasted tomatoes, roasted peppers, and a ruffle of prosciutto slices. Purchased olives and pickled onions and homemade marinated mushrooms. Two 12 inch cakes: one raspberry-almond, the other chocolate. Purchased ice cream and homemade berry compote. People ate pretty much everything. The spreads, which I hoped would elevate the simple cold-cuts-and-bread arrangement, probably were used the least. I think part of this was logistic: people circled in the opposite direction from what I had expected, so they hit the spreads before the meats. 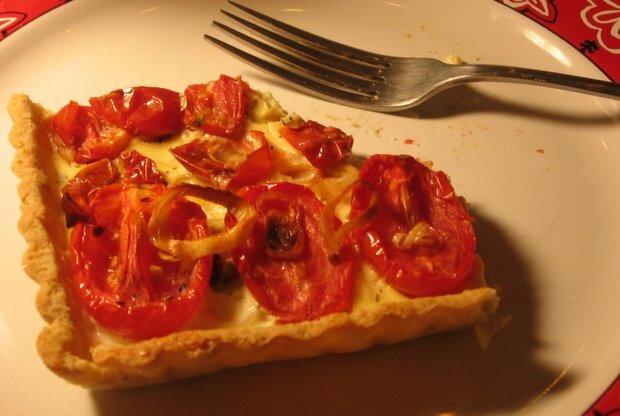 The fig and onion, which was simply a matter of caramelizing onions and folding them into purchased Dalmatia fig spread, was the most popular, and with good reason. It was delicious. But I think overall, people are more afraid of mixing together flavors than I expected. They weren’t sure what meat went with what spread, or if they were supposed to use the spreads with the meats at all, or just on the bread, so they skipped over the spreads entirely. Lesson learned. Next time I do something along these lines, I’ll either make the sandwiches myself or include suggestions on the labels for the spreads. People ate less fruit that I would have expected, too. But they ate more vegetables – the roasted tomatoes were gone in a flash, and the asparagus and peppers soon after. There were beans left over, but I had made an awful lot of beans. The three meats seemed to go over equally; no distinct preferences were shown. Everyone ate the meat, but not with the excitement I think they would have had the crowd been younger. For the under-forty set, home-roasted meat is a comparative rarity, but for these folks it was nothing particularly special, though still a definite step up from deli cold cuts. The cheese was a big deal, though. Some people just stood there and noshed. The raspberry almond cake was a huge hit. I used the Martha Stewart wedding cake recipe from Baking with Julia, brushed with amaretto syrup, then filled with raspberry jam, raspberries, and a plain traditional buttercream. People went back for seconds and thirds, which was gratifying. The chocolate cake was not ignored, but in the end, about a third was left – the raspberry-almond had been annihilated. The ladies loved the marzipan flowers and bees, a comparatively simple decoration that always goes over well. I like it because I do the marzipan work ahead and just place the flowers on the cake that morning. My sister took pictures, but I forgot my camera, so I’ll post when she forwards hers along. That probably won’t be for another week – I’m off on vacation to Maine, where I expect to eat local vegetables and seafood and all sorts of good stuff. I’ll be renting a cottage from a goat/maple syrup farm, so I intend to take lots of pictures and come back with all sorts of food tales. See you then. There's a really interesting article in today's Salon (you have to do the day pass thing to read it) about programs designed to bring fresh produce into inner cities. It's a hard battle, but there's some progress showing. The farmers' market I go to with the most regularity is the tiny, two-stall one in Mission Hill, just down the block from my office. Although most of the people that use the market seem to be employees of the hospitals around the corner, many shoppers do seem to be local residents, some of whom pay with food stamps. Although some of the items (tomatoes, fruit) are more expensive than their grocery-store equivalents, the big bunches of greens, beets, squash and so on are very reasonably priced and provide a lot of nutrition to the dollar. My mother works for a food pantry at her church that receives donated fresh produce from a local farm. Unfortunately, a lot of it goes to waste. It's not that people won't take fresh vegetables; it's that they won't take fresh vegetables they don't know how to cook. Many of the people who use the pantry are from South America or the Carribean. The farmer is Italian. The fashionable arugula and fennel he grows for his upscale clientele are completely foreign to the people at the pantry (and to my Irish mother for that matter, who calls me with questions: I've got this thing that has long frilly leave attached to a white stalk that kind of bulges at the bottom like a garlic, but flat - what do I do with it?). The cultural disconnects are as problematic as the logistics. But both can be overcome. Well, it's over. I actually gave up a little early, because my brother arrived in town and we had both breakfast and dinner out on Sunday, so I let things slide. Having a fridge full of local ingredients means that even a let-your-hair-down, non-local-eating day will include lots of local vegetables and fruits, though. Today's lunch is nearly completely local just because local has become standard for me. The exception is the bread and peanut butter I packed to go with my local salad, fruit and yogurt. I missed bread. It was far too hot to consider baking bread, and of course there are no available breads made from locally-grown wheat, although of course there are many locally-made breads. Bread, lemons, pasta, coffee, gin, and nuts: if we could just find a way to ensure easy access to locally-grown versions of those items, I could do the eat-local challenge forever. And maybe some white flour and sugar to make the occasional cookie. And some chocolate. Okay, so maybe I'm not really that interested in pursuing a fully-local diet for the long-term. But I realized there were definitely places where I could increase my local sourcing. I will continue to buy my cornmeal from Gray's Grist Mill, which is fantastic, and my dried mushrooms from Maine. I intend to be more stringent in choosing local dairy, which are widely available even at my big, mainstream supermarket. I hope to use honey and maple syrup more and sugar less. And, with the exception of the cooking essentials parsley and lemons, the first of which was rarely available at the farmers' markets and the second of which will not grow in New England, I think I can stick to all local vegetables in season without much trouble. I already sourced nearly all of my meat locally. I think that I can move my in-season local eating from something like 50% to closer to 75% without much effort. Winter is another story, and one I fear is unlikely to change without a change in my living situation. With a cellar, more storage space, I could store, freeze and can more local food for the winter, but otherwise I'm stuck. For a final big send-off meal on Saturday, I made a ground beef dish with zucchini, garlic, corn, onions, mushrooms, and peppers. It was supposed to be stuffed zucchini, but two of my zukes had gone soft on me, so I just sort of threw everything into the oven and baked it off (after browning the meat and sautéing the onions, of course). Only the oil and black pepper were non-local. I made cole slaw from cabbage and carrots, sour cream, and mayo made from an egg yolk, olive oil, mustard powder, and a teaspoon of vinegar (non-local items: vinegar, oil, mustard, black pepper, celery seed). I tried to make a cornbread using whole wheat flour, which came out terribly. I think the whole wheat flour absorbed more of the liquid than white would have, and so there wasn't enough moisture for the (non-local) baking powder to react with. As a result, the bread didn't rise well, and there was that unfortunate distinctive metallic-salty flavor of baking powder. (The whole wheat flavor also overpowered the corn flavor.) The guys ate it, though, and didn't think it was nearly as bad as I did. Everything in it was local, save the baking powder, and it might have been okay had I increased the milk. For dessert, we had a honey-peach-sour cream ice cream, and that was really good. Make a custard with the honey, milk and egg yolks. Chill. Fold in sour cream and peach; freeze in ice-cream freezer. Unlike the other honey-sweetened ice creams I've made, the honey flavor did not dominate. The peach came through strong and clear, with a nice sour tang in the finish. I'll make this again.